Many rural residences and farmsteads use yard lights to provide night security and to illuminate driveways and buildings after dark. Selecting the right light will produce the results you want while saving energy. Light intensity is measured in foot candles. One lumen of light energy falling on one square foot creates one foot candle. For general yard security and movement, a light intensity of one half to two foot candles is recommended. This light intensity can be created by 100 to 175 watts of lamp size mounted 25 feet above ground and serving no more than 8,000 square feet. Higher light intensity may be desired in areas of high activity or near building entrances. What type of light fixture? Unshielded lamps send light in all directions. Even standard downward-facing fixtures can lose one third of their light to the sides. A full parabolic reflector fixture will direct the most light to the ground in your target area and allow desired light intensity with a smaller lamp. Lamp efficiency is one factor to consider and is measured in lumens of light per watt of electric consumption, vary widely. Some lamps are slow to start or to reach full intensity. Standard incandescent and halogen lamps produce only 15 to 20 lumens per watt, but come on almost instantly. These lamps are fairly short-lived, but do not suffer from frequent on-off cycles. They are best where use time is short and the lamp is easy to access to change bulbs. Compact fluorescent lamps create 45 to 100 lumens per watt, but take time to warm up to full output and require special ballasts to start reliably below 40 degrees. They are not well suited to cold climate yard lighting. High intensity discharge (HID) lamps such as mercury vapor, metal halide and high pressure sodium lamps have high output efficiency of 30 to 100 lumens per watt and a long life. They require time to start and are best used where they are left on for extended periods. Metal halide lamps are nearly twice as efficient as mercury vapor, and high pressure sodium lamps are slightly higher. Low pressure sodium lamps have the highest efficiency, but are infrequently used because of their distinctively orange color. For general yard lighting that will stay on for extended hours, high pressure sodium is often the lamp of choice, followed closely by metal halide. Payback period on replacing a mercury vapor fixture with a smaller, more efficient high pressure sodium fixture can be as short as two to four years. A new player on the field is the LED lamp. While used for small indicator lights for years, these lamps are now becoming common in household, farm and industrial settings. LED lamp price is still comparatively high, but is falling fast. Light output per watt and lamp life expectancy equal or exceed other options. LED lamps are suitable for cold temperatures and come on instantly. As prices continue to fall, these lamps deserve serious consideration. 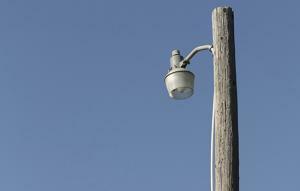 Many yard light fixtures come pre-wired with a photocontroller that will turn the lamp on at dusk and off at dawn. Extra energy can be saved by using a controller that can additionally turn the lamp off for the latter portion of the overnight hours. Called “half night” or “selectable time” photocontrollers, these devices save energy and reduce unwanted light pollution. For local area lighting at building entrances, walkways or work zones such as fuel tanks, consider motion sensor controls. Good yard lighting increases safety, provides security and enhances the appearance of your residence. Choosing the right light for your needs can improve effectiveness and save you money.